Kshitij, a name that only ever resonates with boundless enthusiasm and an undying passion for theatre, is not just the The Streetplay Society of the college, but almost a way of life to its true blue members. A huddle brimming with amplifying energy, the resonance built on a common cry; giving life a new life within a circle, orchestrating your heart beat to the tune of their song, Kshitij has nothing less to offer than a thrilling rush of blood. With its intimate style and participatory approach, Kshitij has been using the holy Dafli and more alike, as instruments of socio-political change through their diverse themed plays for over a decade now. Kshitij was also felicitated with an an award by Padma Bhushan recipient, Dr Bindeshwar Pathak for their performance on Sanitation, in Marora Village, Haryana to mark the momentous occasion of World Toilet Day. 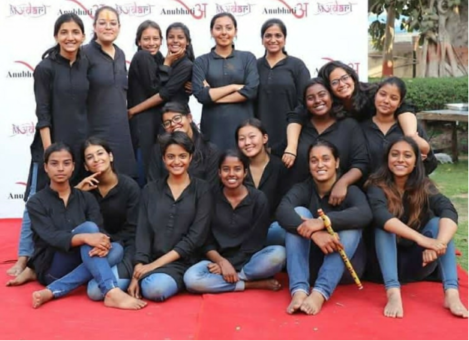 This year, in an unprecedented attempt to celebrate the true essence of Nukkad, we also created a short sub production, 'Seh-mat' - a play that spread awareness about the basic rationale of human consent, and collaborated with various NGOs to take it to numerous nooks and corners around Delhi. Thus, upholding the true spirit wholeness, Kshitij prides itself as The One Confluence of free Multi Dimensional Revolutionary Art.